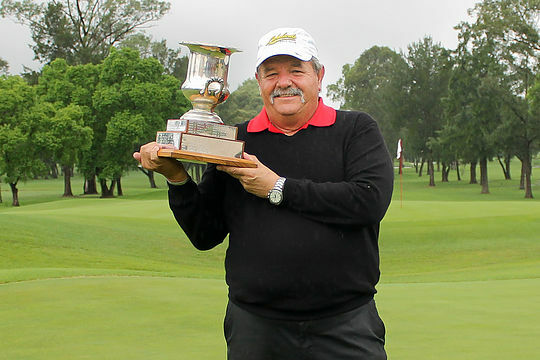 The ageless Rodger Davis showed that he has no plans to put the cue in the rack any time soon, claiming the Coca-Cola Australian PGA Senior Championship in dramatic fashion with a birdie at the third play-off hole to eclipse ‘youngsters’ Mike Harwood and Peter Senior. Starting the day four shots behind the leaders, 64-year old Davis stormed stormed home with consecutive birdies on 17 and 18 at the Richmond Golf Club to shoot a final round 66, joining the play-off with Harwood and Champions Tour returnee Senior at 7-under after 54 holes. “I am so honoured to win this championship as I know the background involved in the establishment of this event. The PGA Legends Tour is growing from strength to strength and to have Richmond as our flagship event is outstanding,” said Davis. Davis’ final round of 66 equalled the low round of the tournament, which was made even more impressive with heavy rain inhibiting low scoring. Rounds of 69, 68 and 66 were somewhat of a surprise to Davis who credited his form to Royal Sydney Professional Ron Luxton’s influence over a conversation at dinner one night. “It was more of a discussion over dinner than a lesson. Ron, knowing my swing, made some suggestions to me which got me striking the ball really well,” Davis said. Davis is a great supporter of the burgeoning PGA Legends Tour in Australia and it’s fitting that he should add the PGA Senior title to a bulging trophy cabinet which includes some 30 victories on the European, PGA Tour of Australasia and Champions Tour in the United States. Tied for fourth and three strokes behind the playoff trio was the group of Tod Power, South African Chris Williams and Legends Tour rookie Peter O’Malley.